On January 12, 2010, a magnitude 7.0 earthquake shook the nation of Haiti, resulting in untold devastation to this impoverished but hopeful country. The news of the catastrophe weighed heavy on my heart. I have traveled to Haiti three times since 2002 as part of a medical mission team. Working with the Functional Literacy Ministry of Haiti, I had been planning a return trip for January 23 before the earthquake struck. All of the pictures and stories covering the devastation can’t help but move us emotionally. Most Americans have not had much exposure to conditions in “Third World” countries, so it is hard for us to comprehend what is described. The reality is that many of these conditions existed for the majority of the Haitian population long before the earthquake struck. Haiti has long been a country lacking adequate resources. Imagine for just a few minutes what your life would be like without food today…without the ability to read or write…without running water…without electricity. Many of us would struggle to make it through a day, let alone a lifetime, without what we see as life’s necessities. Haitians have faced these struggles their entire lives. It may seem that such a situation would be hopeless. However, I know from my visits to Haiti that hope is the one thing that most Haitians do have. You may have seen news reports of Haitians singing in the midst of the devastation. Singing is a frequent response to troubles in Haiti. They have a joy that comes from deep within and doesn’t have anything to do with what they don’t have. Many of my Eat’n Park coworkers have asked me, “What can I do?” or, “Can my money really make a difference?” Perhaps you have asked these same questions. Your contributions to relief efforts, no matter how small, will make a difference. And if you want to make a bigger impact, you might commit to making a monthly contribution to a non profit organization with a history of working in Haiti. Many of these organizations have been changing lives in Haiti for years. At Eat’n Park, we have joined forces with the American Red Cross to make donating easy for our guests who want to make a contribution. Now through January 31, you’ll see collection jugs in our lobbies, where you can donate to the “Haiti Relief and Recovery” fund. The American Red Cross will use these donations to provide immediate relief assistance and support in rebuilding the nation. As for me and the mission team I serve with, we are planning to reschedule our trip as soon as Haiti is open to groups other than first responders and surgical teams. If you feel called to help, stop in to any Eat’n Park to drop off your donation, or click below to get more information about donating through the Red Cross (http://www.redcross.org/) or volunteering through the Functional Literacy Ministry of Haiti (http://www.flmhaiti.org/). 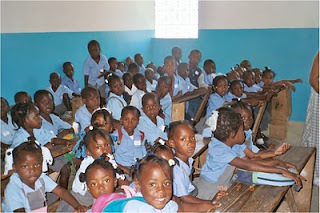 Above: Students at FLM's school in Haiti, before the earthquake. Well, Old Man Winter has certainly made his presence known here at our corporate office, where we’ve yet to see a day without snow so far in 2010! Feeling “under the weather” at some point is nearly inevitable during this time of year, as we struggle to fight off the flu and the common cold. Ever since I was little, I was told by my mother and others “in the know” that chicken noodle soup would cure the common cold. Well, after a little research, guess what I found out? It’s true – at least partially. According to the Nutritional Education Center in New Salem, PA, studies have shown that the broth contains anti-inflammatory properties that help reduce congestion, and it’s a great way to take in fluids when you aren’t feeling up to eating a larger meal. From a nutrition standpoint, this soup contains healthy doses of essential nutrients, allowing you to keep your strength up even though your appetite may be waning. But even if chicken noodle soup doesn’t really “cure” a common cold, one thing I know for sure is that it’s warm and comforting, whether you’re feeling down or not. At Eat’n Park, our chicken noodle soup is such a guest favorite that we offer it every day of the week, along with our hearty chili. We make it from scratch every day with our signature thick, homestyle noodles. Tasty and filling, it’s easy to see why this soup is so popular. Speaking of being popular, I’d be remiss if I didn’t at least mention our much-loved potato soup, available on Wednesdays and Sundays. Though potato soup has no purported medicinal uses, our version is so delicious that it merits a special trip from many of our guests, who stop in just to pick up a quart for takeout. Regardless of which flavor you prefer, there’s no better comfort food than soup on these cold winter days. So next time you’re in the area, stop by Eat’n Park to savor a bowl, or grab a quart to enjoy at home. It’s sure to soothe your soul! P.S. Here’s our daily soup schedule – stop in to enjoy your favorite! Warm up with a free hot chocolate at Eat'n Park! Brrrr…This year has certainly gotten off to a cold start! Warm up at Eat’n Park with a toasty hot chocolate – on the house! Print the coupon below to enjoy a free hot chocolate with your next meal. Valid through January 22, 2010. The start of a new year inevitably brings resolutions (just click here to read mine and those of my fellow blog contributors), and for many people, that means vowing to eat healthy in the upcoming year. We all know it can be difficult to keep that resolution when dining out, since it can be hard to find meals that are healthful AND delicious. To further complicate matters, figuring out just how healthy a meal is can be downright impossible. But not at Eat’n Park. We’re proud to say that we cater to our guests’ dietary needs, whether that means offering celiac-friendly options, reduced-sodium choices, vegetarian items, or meals that are what we call “Eat’n Smart”. We have 20 items on our menu that fit our Eat’n Smart criteria of having less than 500 calories, 20 grams of fat, and 150 milligrams of cholesterol. So, whether you’re joining us for breakfast, lunch, or dinner, you’re sure to find a healthful, tasty meal at Eat’n Park. Best of all, it’s easy to know which of our items fit these guidelines, because every one of them is marked with our “Eat’n Smart” logo, AND they’re all listed on the back of our menu, along with the calories, fat, cholesterol, and fiber content. Pretty easy, huh? Even better, if you’re looking for detailed nutritional information, just turn to our online nutrition calculator. You can pick your favorite meal and then customize it to see how it affects the nutritional content. Personally, my favorite custom meal is our chicken fajita salad. Ordered normally, this item has 734 calories and 43 grams of fat, but I can quickly convert this item into less than 400 calories. And, if I can resist eating the tortilla shell, I can cut it down to 250 calories and only 6 grams of fat. Here’s how I do it: Most of the calories and fat are in the Cajun Ranch dressing. OK, it is really good, but if you’re looking to cut back, you have to make some sacrifices. I cut the dressing and the sour cream and ask for some extra salsa. I use the salsa as my dressing and now I’ve got a great tasting, Mexican salad with only 246 calories and 6 grams of fat. It’s one of my favorite menu items. At Eat’n Park, we love to serve it your way. Customize anything you want to fit your needs. It’s no problem. Just click here to try the nutrition calculator for yourself. Once you’ve created your customized meal, you can even print it and bring it to the restaurant with you! No matter what your resolution is this year, I wish you the best of luck in sticking to it. Here’s to a happy and healthy 2010! 2010 is here already, and it just wouldn’t be right if we didn’t make a New Year’s resolution! So, we asked our blog contributors to share theirs. Read on to see what you can expect Jamie, Regis, and Kevin to be working on and blogging about in 2010. At Eat’n Park, our sustainable New Year’s resolution is to develop a fully-encompassing recycling program. Currently, we recycle cardboard at all of our locations, but we want to increase our recycling efforts this year to include bottles, cans, and other recyclable materials so that we can further conserve natural resources and save landfill space. I’m looking forward to this challenge and I’ll continue to update you on my progress on moving this forward. Below are some sustainable resolutions that I hope that you might adopt. Before recycling any paper, make sure you have used both sides. The back side of copies, memos and outdated materials can be kept in your printer for printing drafts, or used as scratch paper. Put your computer to sleep when leaving the office for a meeting or lunch break. Don’t forget to turn off the lights too! Travel wisely. Consider riding a bike, carpooling or taking public transportation to work, meetings or appointments at least 1 day per week. Riding a bike not only reduces greenhouse gas emissions, it is also an excellent way to get in shape- the #1 New Year’s Resolution most often made in America! Use those reusable bags! Find a convenient place to keep your reusable shopping bags so they are not forgotten when heading out to the grocery store. Many local grocers even have incentive programs for shoppers who bring their own bags. Make recycling a family affair. Enlist the help of your family to clean recyclables and place them in the recycling bin instead of the trash. Consider reusing items that you normally would not. Be creative! An oatmeal container can be cleaned out and decorated to make a fun pencil container on the desk. Start a compost bin. Composting can be a fun family project that has great benefits for your family and our environment. As we move into the new year, each of us will make New Year’s resolutions, and by the end of January, most are forgotten. I would like to share with you a few of mine that I promise to continue throughout the year. I will work to enhance training for cooks in our restaurants to ensure that each guest’s meal is made right the first time, every time. I will develop a better system for providing each guest with a higher quality, more compelling breakfast buffet and Sunday brunch. I will find a way to engage our best cooks and involve them in bringing new recipe ideas to our guests. I will get back to five mornings a week in the gym with fellow blogger, Jamie (I’ve been slacking off a bit lately). Here’s to a fruitful New Year! Lemon Sole – This is a great healthy choice that is also one of the best tasting items on the menu. I order the smaller portion version at less than 200 calories and add carrots and a fruit cup as my sides. Chargrilled Sockeye Salmon – Another healthy choice that comes with two sides. The nice thing about Eat’n Park is you can choose whatever sides you want. With this, I’ll take a Garden Salad with Fat-Free Italian dressing and some carrots. Rosemary Chicken is another delicious item that is so good that it actually feels indulgent to eat healthy. The smaller portion is less than 300 calories and only 9 grams of fat. Gardenburger – I was never a big Gardenburger person until I tried Eat’n Park’s. Our classic gardenburger is very tasty and is only 220 calories and 4 grams of fat. When I feel the need for something a bit more indulgent, I order our American Grill burger and sub the Gardenburger for the Black Angus burger. It saves me about 200 calories and about 17 grams of fat. I’m not sure it quite meets our Eat’n Smart standards, but boy, is it good! These are just a few of my favorites, but there are plenty of other healthy combinations that allow me to mix it up. I often use Eat’n Park’s nutritional calculator to figure out how I can tweak my favorite items to get them to be more healthy. The calculator lists each ingredient and its nutritional information, so I know exactly what I’ll save if I order that sandwich without mayo. Click here to try it yourself. If you’d like to hear more about my favorite health-modified menu item, click here. Have a happy, healthy 2010! Recently, we’ve received some attention regarding a lawsuit we filed to defend our trademark for the Smiley Cookie®, our famous brand icon that is known and loved by Eat’n Park fans across the country. Many people are surprised to learn that we do own the trademark for a smile on a cookie and the name “Smiley Cookie” referring to it. Under U.S. trademark law, we are required to defend our trademark or we lose it. So, while we aren’t a fan of lawsuits, we do occasionally file one to protect the rights to our trademark. We’ve owned this trademark since the 1980’s, when we first introduced the Smiley Cookie in our restaurants. Smiley Cookies and the Smiley Cookie icon have since grown to be a huge part of the Eat’n Park brand. Smiley Cookies are one of the most recognizable icons in western Pennsylvania and are sold throughout the country at www.smileycookie.com. While we’d much prefer to spend our time focusing on serving our guests great food at a great price, we are required to defend our trademark to keep it. We are a family owned, Pittsburgh-based company, and we make every effort to have a positive impact on our community. Our Smiley Cookies help us in that mission. We donate more than 200,000 of them to local non-profit organizations every year. These organizations use our Smiley Cookies at their community and fundraising events. We also give away more than a million Smiley Cookies each year to children in our restaurants. Some other ways that we support our community include donating 5% of our pre-tax profits to charity each year. For the last 31 years, we have helped to raise money for local children’s hospitals and have raised more than $7 million to help kids who need care. We pioneered the distribution system that allows farmers to sell produce to local restaurant chains. Many local farmers have credited Eat’n Park with helping to save their family businesses by creating a new market for their crops. Additionally, we have been recognized nationally by the Points of Light Foundation as one of the leading organizations in the country promoting volunteerism.